Building a network of interaction between a bunch of genes can help a great deal in understanding the relationships between the seemingly disparate elements from your list. It can seems challenging at first to build such network but it's less complicated than it looks. Here is an approach I use. Resources to obtain interactions information are numerous. Logically we think to go for the central repository if it exists. Unfortunately, for protein-protein interaction (PPI) there are severals (IntAct, BioGRID, HPRD, STRING...). Using the API developed for these repo would require time and we usually don't have it. Fortunately, the gene web page from NCBI Entrez gene compile interactions from BioGRID and HPRD which seems like a reasonable and robust compromise. And on the other we can use the XML package to parse the web page. First, we need a gene list, here I refer you to an earlier post where we extract a list 274 significantly differentially regulated genes. Using the following little function you can scrap the interaction table from the NCBI web page. Here is a quick example with the first 20 genes from my list. You obtain your edge list in the form of a data.frame. The NCBI2R package provides a similar function but there is a bug in GetInteractions(). 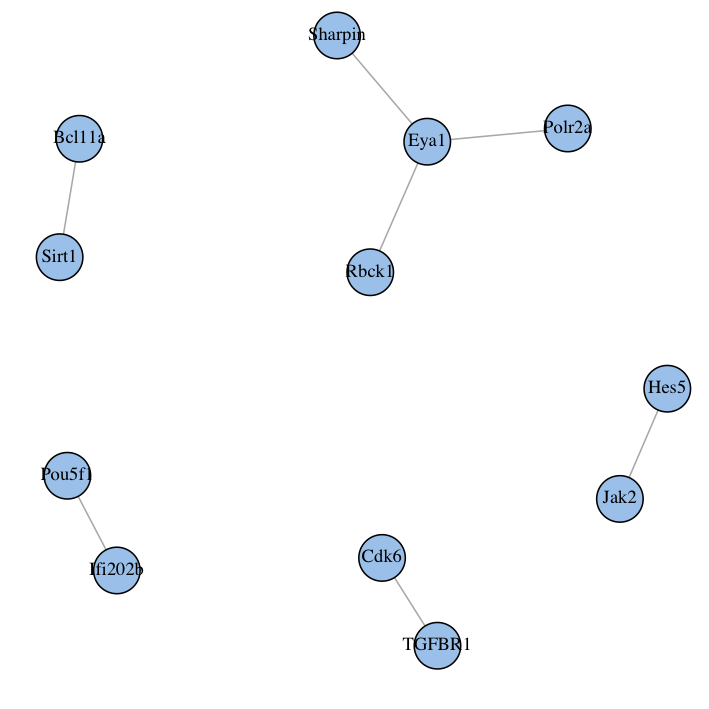 You can write this dataframe to a text file and import it in Cytoscape directly but you can also display and work your network directly in R using the igraph package. The network is simple and not fully connected but consider we obtained interaction for 5 genes out of 20 here only. Great walk-through! It would be great to have a generic method to test if a group of proteins are more closely connected in terms of a PPI than allowed by random chance. There has to be work done on this already, but I'm not aware of an automated way to simply input a list of say 5 genes, and get a p-value for how closely related they are in terms of a PPI. If I undertand you well you want to know what are the odd that your genes are connected compared to a random set of genes. Biological network follow a power law so many genes will have few connection and a few will be highly connected [I just read "linked" from Barabasi]. There should definitively be some work done on that for sure. But from the top of my head you would need to compute the empirical distribution for your universe (e.g. you microarray) and sample from it 5 random genes and observe how many time the random network end up more connected than yours. Basically an FDR. The advantage is that empirical distribution can be pre-computed and would not change except when interaction repo are updated.